Crochet Halter Tutu Dress Ages Newborn Up To 6 Yrs. Various colors, custom order, coordinating ribbon. FREE USA shipping. 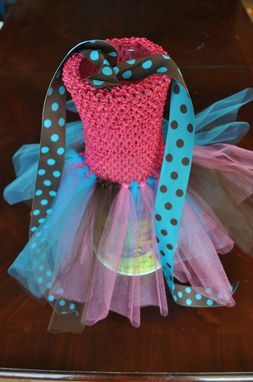 This dress comes with a 6" halter top in hot pink, with shocking pink glimmer, turquoise, and brown tulle at 8" long, with turquoise/brown dot ribbon. This fits sizes 0-24 months.